Airport metal detector. 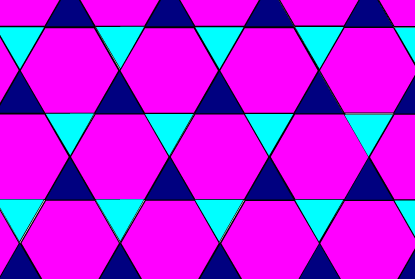 Credit: commons.wikimedia.org. You have just arrived at the airport, two hours early for your flight. You check in your bags, after waiting forever in line, and then walk to security, where you wait for an equally long amount of time. While on line, you take off your shoes, your belt, and your sweatshirt and take your computer out of your bag. As you get closer to the front of the line, you place all of the items you’re holding in a plastic bin, which you take from the pile of plastic bins waiting by the x-ray and metal detectors. You place the plastic bins and your bag on the conveyor belt leading to the x-ray machine and then walk over to the metal detector line in preparation for the final security measures. You try to remember if you have any contraband items on you as you walk through the grey metal detector (the color reflects your mood at the moment, for airport security is most certainly not the highlight of the day). This remembering is confirmed as the metal detector lets out a loud, annoying BEEP BEEP BEEP and the security guard nearby asks you to come with him so he can scan you and see just what you are trying to sneak through. He runs his scanner all over your body, and as it passes by your wrists, BEEP BEEP BEEP – you had forgotten to take off your metal bracelets. The security guard takes them from you, runs them through the x-ray machine, and makes you pass through the metal detector once more. You do so, and as you walk through, you are relieved that the metal detector is no longer angry with you, for it does not BEEP BEEP BEEP in contempt. Once safely on the other side of security, you rush to collect all your belongings from the x-ray machine deposit area and decide to visit the nearest Hudson News store to buy some chocolate for the plane ride, a reward to yourself for enduring the minor ordeal you just experienced. On a recent trip to Costa Rica, my family had a first-hand experience with the airport security machines. While on line waiting to pass through the traditional metal detector, my thirteen-year-old sister was ushered over to the line for the millimeter wave machine. My family thought nothing of it until she passed through the machine…and it detected an explosive material on her hands. The security officers immediately took her to the side and took a swab from her hands for further testing, and those results also indicated possible explosives. She was then taken into a separate room to do a more thorough, private pat down, the results of which indicated that the possible explosives the machine had detected on her hands were really the hairspray that she had used that morning. Although airport security measures can certainly be considered time-consuming, as well as sometimes annoying (when you and the metal detector do not agree with each other), it is a necessary procedure in order to ensure the utmost safety on the flight. The airport metal detectors themselves are able to provide this security using a great deal of technology and, more specifically, physics. Basic metal detectors are created by using two pieces of coiled wire (one called a transmitter coil, through which the electricity that powers the machine flows, and the other called a receiver coil, which is attached to a sound system) to create a magnetic field. When a piece of metal enters through the magnetic field, the electricity powering the magnetic field runs through the metal object, creating a second magnetic field around the object. This metal field then reacts with the receiver coil, which, in turn, then triggers the sound system. 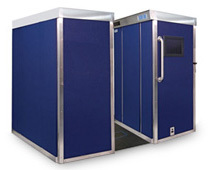 When implemented in airports, the magnetic field created by the metal detector is large and encompasses all of the space underneath the rectangular arch that the metal detector makes. If a person walks through the metal detector and sets off the alarm, airport security is informed that this person could potentially be hiding a dangerous, metal-based weapon, such as a knife or a gun, and further research is conducted. According to a fact sheet on airport security produced by the Health Physics Society, “Even though magnetic fields [created by metal detectors] are a form of radiation, the radiation the machine emits is nonionizing … [and] does not cause biological damage. Therefore, even repeated exposure to metal detectors has no associated radiation risk.” With this in mind, airport metal detectors seem like a very effective and safe method of enforcing security in airports.This is certainly true in most respects; however, there are, in fact, some downsides to metal detectors. For example, many seemingly mundane objects can set off the metal detectors simply because they contain small amounts of metal. According to a 2010 article by Gary McKechnie, “7 Surprising Items That Set Off Airport Security,” these items can include aluminum foil wrappers (such as those used to package gum), headbands (due to the metal used to structure the headband), and underwire bras. Aside from these minor setbacks, however, metal detectors are overall a great method of maintaining security in airports. The concept of metal detectors was first introduced as a form of airport security in America in 1972 as a means of preventing people from hijacking planes, which had been occurring frequently. At that time, metal detectors were not sophisticated enough to detect all sizes of metals and security officers themselves were more lax regarding the security regulations, such as that everyone is required to pass through the security detectors. This did not change until after the terrorist attacks on September 11, 2001; the airport security community knew that, in order to prevent another terrorist attack via hijacked airplanes, they would have to be more vigilant. 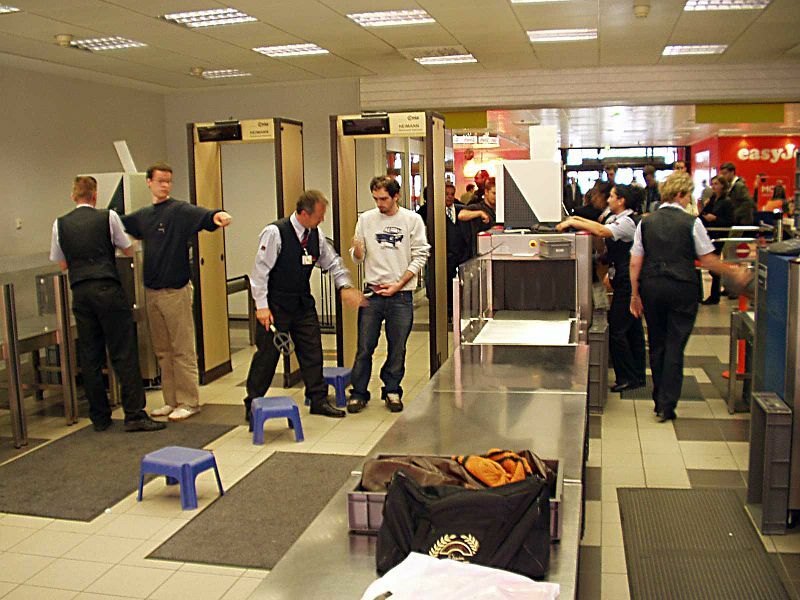 Thus, the technology of the airport metal detector was improved and several other security devices were put into use, such as the backscatter machine and millimeter wave machine, that all approached the need for airport security slightly differently, regarding both the design of the machines and in what way they are meant to detect different materials. Both the backscatter machine and the millimeter wave machine differ from the traditional airport metal detector in that they both have the ability to detect materials other than metal. They do this by utilizing either radiation or, similar to the airport metal detector, electromagnetic waves. According to a 2010 New York Times article by Susan Stellin entitled “Are Scanners Worth the Risk?”, “The more controversial ‘backscatter’ devices [(controversial in part because the exact amount of the radiation given off by this machine is unknown)] project an X-ray beam onto the body, creating an image displayed on a monitor viewed by a Transportation Security Administration (TSA) employee in another room. The “millimeter wave” machines, which are considered less risky because they do not use X-rays, bounce electromagnetic waves off the body to produce a similar image.” At first, in 2010, both of these machines were used in airports, but they met some critical reviews, mainly by people unclear about exactly what image these machines displayed to an airport security officer. As with the initial reception of the airport metal detector, people also wondered if these security measures infringed on their rights. In the end, though, the TSA announced at the beginning of this year that all of the backscatter machines would be removed from airports and replaced with the millimeter wave machine, in addition to keeping the traditional metal detector in airports as well. Millimeter wave machine. Credit: commons.wikimedia.org. Although the millimeter wave machine, like the backscatter machine, is a bit controversial regarding the lack of knowledge about what exactly airport security can see in the images projected by this machine, it is, in the end, less risky than the backscatter machine because it does not use radiation waves that could be harmful to the human body. Instead, as explained by a New York Times article, “Using Advanced Physics to Find Concealed Weapons,” by Matthew L. Wald, “millimeter wave sensors are passive and rely on detecting energy emitted by objects.” The machines work by bouncing electromagnetic waves off a person’s skin to create an image of the person’s body and any objects on it, which can be detected because “[t]he energy the sensors look for is in an unfamiliar part of the electromagnetic spectrum…Human bodies radiate the energy at a rate higher than metal, plastic or composite materials, so those objects can be spotted under clothing, in silhouette.” So, by using physics that is more advanced than that used in the traditional metal detector and that relies on picking up the waves emitted by objects rather than searching for objects with a magnetic field, the millimeter wave definitely improves the level of security in airports by showing airport security officers exactly where a contraband item is on a person’s body and what exactly that item is, as opposed to the traditional metal detector, which just informs the security officer that the person has a piece of metal located somewhere on his body. As my family’s experiences can attest to, the millimeter wave machines has its flaws, which is one of the reasons it is used in conjunction with the traditional metal detector. Neither machine is perfect, and so they must work together to make up for their flaws or incapabilities.I am sure that, as time continues to pass, the physics and technology behind airport security will only continue to improve; who knows what kinds of amazing security machines we will be able to utilize in the future! In the meantime, though, the next time you go to an airport and prepare to pass through security, I ask you not to think of the process as annoying and too time-consuming, as I once did. Rather, think about how amazing it is that concepts in physics, both simple and complex, can be used to ensure the safety and well-being of each airplane passenger. This leads me to my creative challenge of the day: take a funny personal anecdote and explore it in terms of a certain field involved (for example, I took an anecdote about metal detectors and explored it through physics). What are some of the anecdotes you wish to explore? What field of study does it relate to? Comment below to discuss.